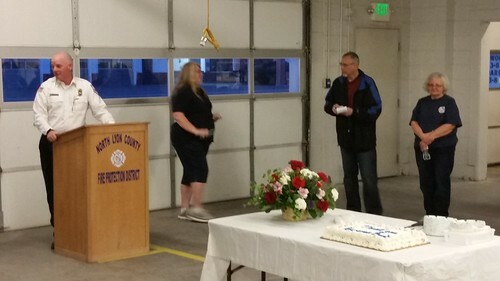 Tonight was the regular meeting of the North Lyon County Fire Protection District. Lisa and I went over first for the workshop before the regular meeting at 6 PM. 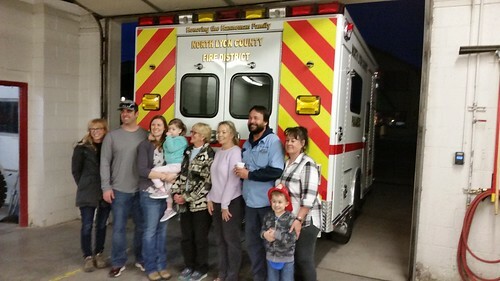 Lisa had been up all night working on a project in the house and had to go home before the main meeting, which is a shame, because shortly after the meeting started, it recessed for a dedication ceremony for the department's new ambulance, and I think Lisa would have enjoyed it. 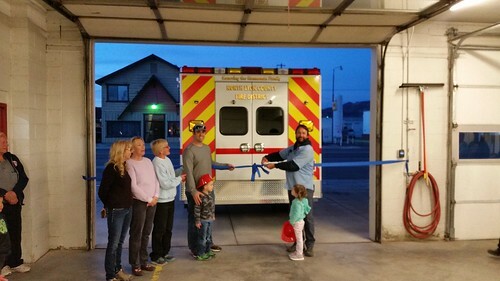 Many members of the Hanneman Clan were present for the ribbon cutting, after which many people (including me) put our shoulders into wheeling the new ambulance into the fire station for its formal dedication. Chief Scott Huntley said a few words, after which the Sheriff department's chaplain spoke a dedication for the new equipment. 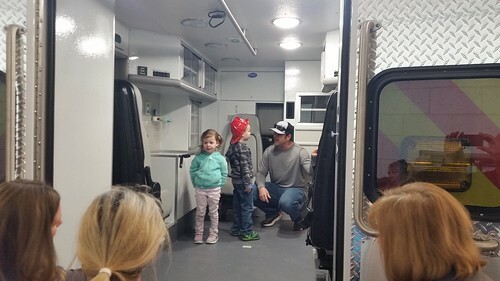 The new ambulance was then opened up so we could have a look inside before it is fully equipped and put into service as Rescue 161. 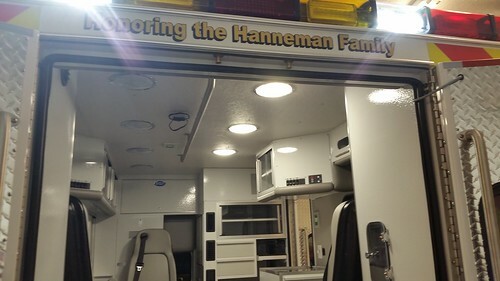 The Hanneman children and the rest of the family were the first to have a look. As I understand it, the "box" on the back is expected to long outlast the truck body on which it sits. It's designed so that when the vehicle needs to be replaced, they can slide the box off the old chassis and onto a new one. This keeps the long term costs down, of course. I had a look inside myself, sitting in the rear-facing seat visible behind the Hanneman children in the previous photo and looking through the open rear door. 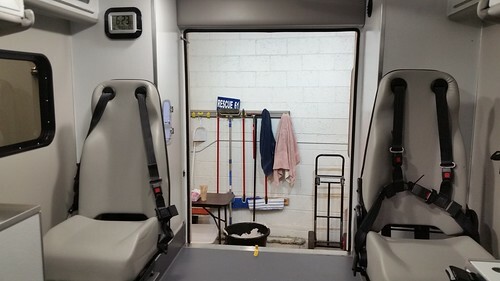 The side seats are designed to protect the ambulance crew but also to be able to fold down to form a bench seat to provide additional capacity if needed. After the dedication ceremony, coffee, and cake, those of us who stuck around went back to the meeting room for the regular meeting. I'm not going to discuss the substance, other than to say that having been a director of a number of non-profit corporations, much of it was familiar in form, although the specific substance was of course different. I'll have more to say about this later.